Schoolteacher Paula Carson and her daughter Jill lead a double life! 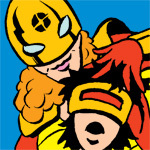 When danger threatens Apollo City, they don the costumes of LADY SPECTRA & SPARKY! With brains, brawn, and laser bracelets, they battle the nefarious villains who threaten the innocent! Paula is not having a good day. Man, these mindgames are getting personal and BRUTAL! You may remember Vashali from her battle with Phantos. She seems to have healed up nicely since then.